The stakes are higher than ever in the intense action-adventure "Death Race: Beyond Anarchy," arriving Unrated and Unhinged on Blu-ray™ combo pack, DVD, Digital and On Demand January 30, 2018, from Universal Pictures Home Entertainment, in association with Impact Pictures/Chestnut Productions. Franchise newcomers Zach McGowan (“Black Sails”) and Danny Glover (Lethal Weapon) join returning Death Race fan favorites Danny Trejo (Machete) and Fred Koehler (“American Horror Story”). "Death Race: Beyond Anarchy" also features talented actors Christine Marzano (Rules Don’t Apply), Terence Maynard (Edge of Tomorrow) and Velislav Pavlov (The Expendables 2). 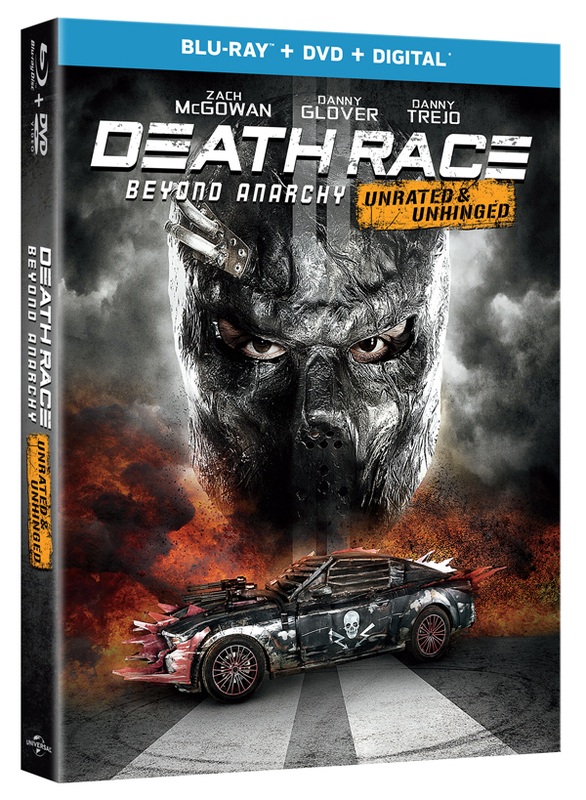 Additionally, Death Race: Complete 4-Movie Collection will also available on DVD on January 30, 2017. Now fans can experience the glory of all four movies in one complete must-own set including, Death Race, Death Race 2, Death Race 3: Inferno and the all-new movie Death Race: Beyond Anarchy. Inside the Anarchy: Filmmakers and cast describe how this chapter of the Death Race franchise stands out from the rest. From new locations, to a fleet of new cars, to a new star in Zach McGowan, see why Death Race: Beyond Anarchy is the deadliest Death Race yet.